Garmin Edge 205 designed for cyclists, features a grey-scale display and measures speed, distance, time, calories burned, altitude, climb and descent plus much more. Garmin Edge 205 also features Virtual Partner which allows you to race yourself over your regular rides to check your process. Easy to use - simple start-up, with no wheel sensors or calibration necessary. Garmin Edge 205 is easy to switch between bikes and includes a 12 hour battery life. Accessories, spares and parts are still available for your Edge 205. Take your ride to the next level with the Garmin Edge 205, Garmin's GPS-enabled personal trainer and cycle computer. Whether you're a competitive racer or weekend cyclist, Garmin Edge will help you achieve your personal best. Rugged, lightweight Garmin Edge 205 attaches easily to the stem or handlebars of your bike with the included bike mount. Just turn it on, acquire GPS satellites and go. Edge automatically measures your speed, distance, time, calories burned, and also records the route you have taken for review. For even more detailed data, get the Edge 305, which can track your heart rate, cadence, climb and descent. ‣Easy to install; no calibration required. Just snap it into the bike mount and go. ‣High-sensitivity GPS receiver tracks your position even in tree cover and canyons, making it extremely reliable for location, distance and speed information. As an added benefit, you can plan, analyse and store data from your workouts using free Garmin Training Center® software, which lets you analyse data with interactive graphs that chart your speed, time and elevation. Overlay your ride on a map so you can pinpoint specific areas and see how elevation and other factors affect your performance. Or, upload your workout data to MotionBased.com, Garmin's web-based application that provides in-depth analysis of your workouts, online mapping and route sharing that will take your training to the next level. Endurance athletes can also use the Garmin Edge with TrainingPeaks.com, an easy-to-use web-based training system designed to help athletes train for any event. Looking for accessories and spares for the Garmin Edge 205? 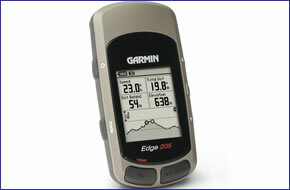 All parts are genuine Garmin product and specifically designed for use with the Garmin cycle GPS 205 device.